As we are only hours away from the tip of the 2013 National Championship game between the Michigan Wolverines and the Louisville Cardinals both fan bases are hoping that a long title drought will come to an end tonight. 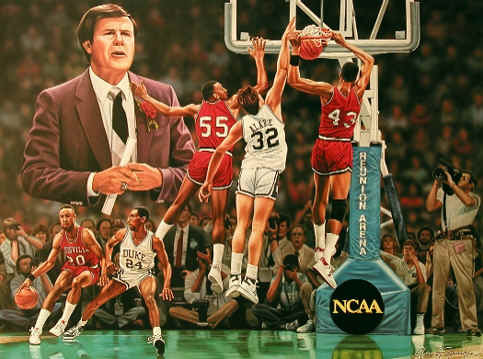 While a lot of the focus has been placed on the Wolverine teams of the past; the 1989 championship team that was led by Glen Rice and Rumeal Robinson and the Fab 5 team that lost to UNC after the infamous time out called by Chris Webber (who in my opinion needs to swallow his pride and make things right not only with his teammates, but also the university) but people are forgetting that the Cardinals too are looking to cut down the nets after not having done it since 1986. While digging in the video archives called YouTube I came across a video recap of the 1986 championship team that was led by freshman “Never Nervous” Pervis Ellison (who won the Most Outstanding Player award for the Final4) and senior Milt Wagner. The Denny Crum led Cardinals were able to win the championship after going 32-7 (10-2 in the Metro conference… yeah I didn’t remember that conference either), getting the number 2 seed in the West bracket, breezing by the LSU Tigers in the Final4 semi-finals 88-77, and holding on in the championship game by the score of 72-69 against a tough Duke Blue Devil team that had won a record 37 games, 21 in a row, and was led by All-American guard Johnny Dawkins who was that years winner of the Naismith player of the year award. Is Hiring Jim Harbaugh U-M’s Last Ditch Attempt at Football Relevancy?